On March 3, 2012 I predicted, based on a very reasonable explanation made by my friend Jason, that the sixth generation iPhone would be called "iPhone LTE" or "iPhone 6". I took that prediction one step further and bet another friend, techyted, a Starbucks coffee it would be so; he bet it would be called "iPhone 5". I lost that bet when Apple named its sixth generation incorrectly (based on my logic) as "iPhone 5". Really the bet was that it would be called "iPhone LTE", based on the fact that Apple had to include the LTE antenna technology to stay competitive, and would name it such to highlight this much needed speed boost in antenna speed. With the second generation iPhone taking the name "iPhone 3G" to highlight the inclusion of the 3G antenna, which was really the only complaint first generation iPhone users had, "iPhone LTE" seemed a smart name for this sixth generation iPhone. It would also allow Apple to skip 5, since the "iPhone 4S" was the name of the fifth generation iPhone. Let me break down the naming vs generations from the beginning. The first iPhone was called "iPhone", which made perfect sense since it was the first phone to be called that (well technically that's not true either, but that's a whole other story). The second iPhone was not called "iPhone 2" however, because Apple wanted to clarify it had added a faster cellular antenna system; they called it "iPhone 3G", helping market the fix of the first generation's biggest flaw. When the third generation iPhone arrived, Apple simply added an "s" to the second generation's name to exclaim its speedier innards. This also allowed for the number 3 to be in the third generation's name of "iPhone 3Gs". Then came the fourth generation of the popular phone and it was simply called "iPhone 4". That seemed to make perfect sense because by that point we all got the point. It was the next iPhone, and this was the fourth one. But, when Apple introduced the fifth iPhone, they went back to adding an "s" because it was a faster 4. Although this followed some of the previous naming processes Apple had used, it wasn't where I would have gone because now it's like saying, "Hey everybody, you are all right in thinking Apple doesn't do everything it can to advance to the next level with each release of its products. We slow play our ideas so we can extend just enough each year to make you think about upgrading. We don't do everything our billions of dollars in reserves could to bring you exciting and new ideas. We go just far enough to make you think it's better. The 's' stands for 'slightly' better." That brings us to the announcement of the sixth iPhone generation. This phone was predicted to have LTE cellular antenna technology; and it does. To market that addition, it seemed logical to me to continue naming the generations with the latest and greatest improvements to the device. The speed increase is one we've been waiting for. "iPhone LTE" made the most sense to me, in sticking with the Apple naming method which touts the phone's most recent improvements. 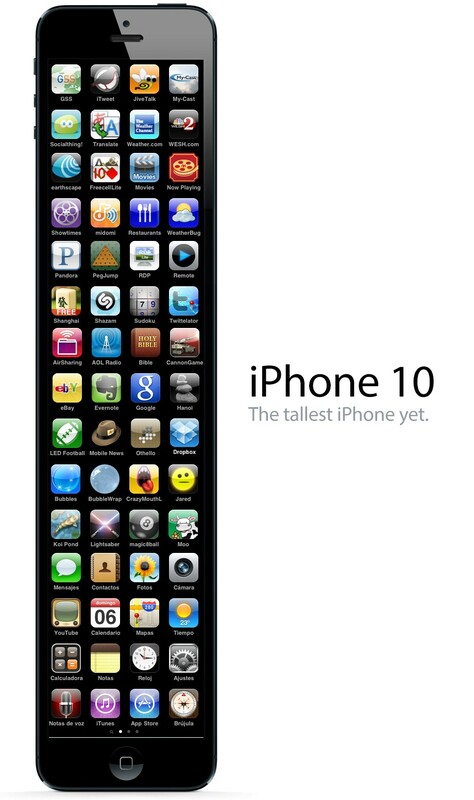 Apple could call it the "iPhone 4 inch" to tout the screen size, but it might be confusing with previous name choices. If not "LTE" then a return to the simple generational name "6" seemed to make some sense because this wasn't the fifth generation. "5" didn't seem to make any common sense, with this being the sixth generation. Really, I can see how "6" would have be confusing, since the number 4 is in the fifth generation's name already. Im sure people would ask, "Where did 5 go?" But to clarify two more things to avoid the pending arguments I'm sure to create: If the first iPhone was a "beta" phone, making the 3G "1", iPhone 4 would have been "iPhone 3". And, if the pattern is to add an "s" to every other year, as the body doesn't change, 5 still doesn't make since because there have only been four body styles (or three if you consider the first iPhone just a beta phone). So, why not call it 6? Besides the obvious confusion that would be caused by skipping the number 5, this IS the sixth generation of the phone. It would also be simple to match it up with sixth major update to the OS, which Apple announcement will ship with iPhone 5. And while they were at it, Apple announced their newest processor too. The "A6" chip was announced, which brings faster processing and graphics to this sixth generation iPhone. It almost seems too perfect. Oh, but there it is. iPhone 6 running iOS 6 on an A6 chip. Too many 6's in a row for big, evil Apple to reveal its true self. You win fanboys. You win. 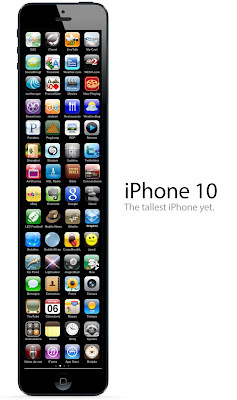 One more thing: if they continue to increase by one number every two year, adding an 's' to every other, the iPhone 10 pictured above will be the sixteenth generation. 10 is 16. 10-16. That's the radio code for "pick up prisoner". Do you see what that means people? Do you? Audi is "Beauty Made Powerful"